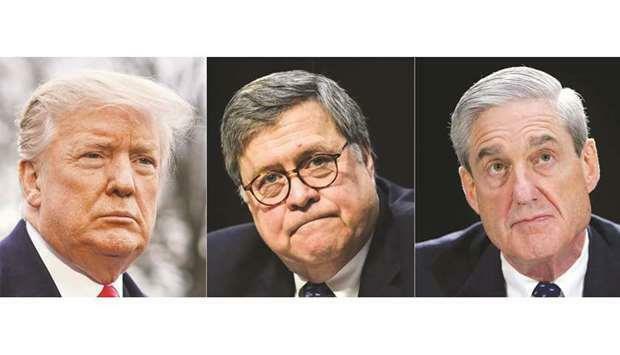 (MENAFN - Gulf Times) Attorney General William Barr plans to release a redacted version of Special Counsel Robert Mueller's report on Russian interference in the 2016 US election and contacts between Moscow and President Donald Trump's campaign on Thursday morning, the Justice Department said yesterday. Moments after the department announced its plans for releasing the report, the Republican president went to Twitter to make another attack on Mueller's team and derided the 'Russia Hoax. The Mueller investigation has cast a cloud over the presidency of Trump, who has often called it a politically motivated 'witch hunt. Mueller turned over a copy of his confidential report to Barr on March 22, ending his 22-month-long inquiry. Two days later, Barr released a four-page letter summarizing what he said were Mueller's primary conclusions. Barr also wrote that Mueller presented evidence 'on both sides about whether Trump obstructed justice, but he did not draw a conclusion one way or the other. After Barr released his four-page letter, Trump claimed 'complete and total exoneration, condemned 'an illegal takedown that failed and accused unnamed political enemies of treasonous acts. Last week, Barr told a US Senate panel he believed that 'spying did occur on Trump's campaign, and he plans to investigate whether it was properly authorized. 'I think spying did occur, Barr, the top US law enforcement officer, told the lawmakers. 'But the question is whether it was adequately predicated.